The consequences of a poor monsoon are worryingly uneven across the country. Come monsoon season, a familiar concern mushrooms across India: would the rains be deficient and wither the economy, or will they be bounteous and nurture growth? This monsoon season - which started as usual in June and is to last until September - is no different, with analysts warning ahead that economic growth in the coming year would hinge on good rains. And with plentiful rain thus far, government officials are upbeat about this year’s economic outlook. This annual preoccupation with the monsoon’s impact on overall national productivity, however, is misleading. Overall productivity in India no longer depends on the monsoons as it did in the last century, when the rain-dependent farm sector made up about 40 per cent to the national output. Then economic growth in the country closely mirrored rainfall patterns, plunging sharply with poor rains and soaring with good monsoons. That spell broke around the turn of the century as the country urbanised and the economy shifted away from the agrarian base - to service industries, which currently accounts for over 50 per cent of national productivity. Over the last 15 years, the rain’s impact on economic growth has been insubstantial and insignificant. 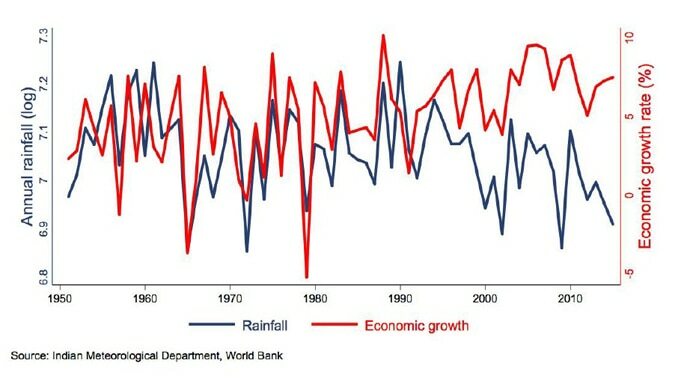 Overall economic growth in India is now rainproof. But the welcome development has also exposed a widening of the country’s old rural-urban faultline. The rural states in the country have historically lagged behind their relatively urban counterparts in generating economic growth. 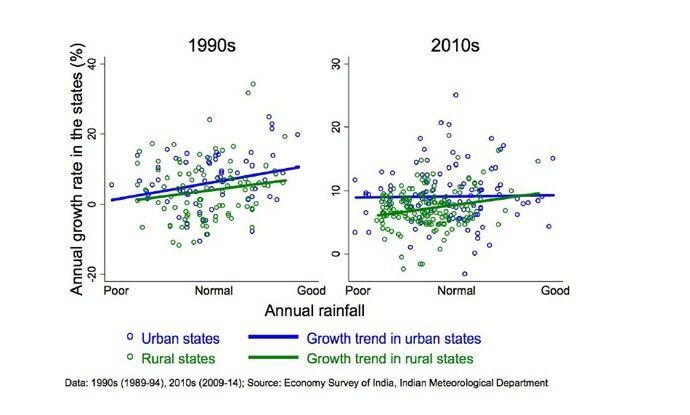 But, in the past, the state economies had one thing in common: growth in both the rural and urban states was subject to the vagaries of the monsoon, rallying during good monsoons and slumping during bad ones. Such were the state of affairs, for instance, in the early-1990s, when even the relatively urban Indian states – those above the national urbanisation rate of 25 per cent – were largely rural. That pattern no longer holds. The umbilical link between the monsoon and the economy is now severed in a third of the Indian states that are over 40 per cent urban. With just 10 per cent of productivity derived from agriculture, economic growth in these urban states has totally broken free from the monsoon’s spell even as those in the rural states continue to critically hinge on the rains. It’s this tectonic parting of the rural and urban states that the rain-proofing of the Indian economy lays bare. And this great divergence isn’t just about abstract statistics on aggregate economic growth; it has real consequences for the lives of ordinary people. Year-on-year change in average household consumption and food expenditures in the states shows similar divergences. Plentiful rains in the rural states brings on greater spending on consumer items and food but a bad monsoon is followed by severe cutbacks, on average a 10 per cent cut in household spending on consumer goods and food items. With over 75 per cent of the country’s poor living in rural areas, the consequences of such spending cuts are easily imaginable: increased poverty, malnourishment and distress migrations in search of livelihood options. No such dire consequence befalls urban states when the rains fall short. 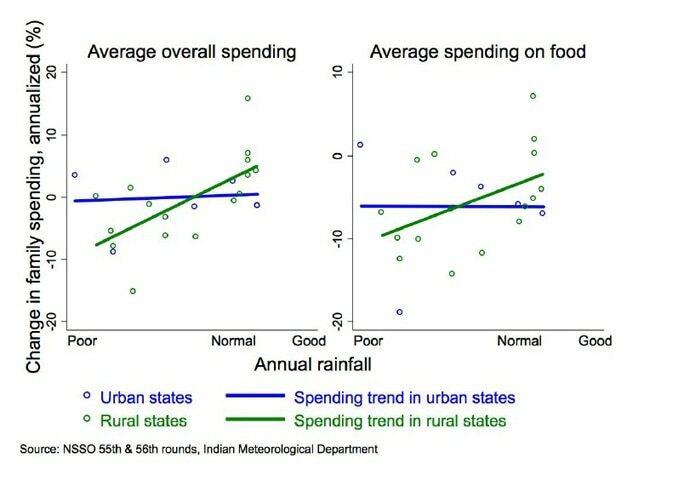 With relatively steady incomes from nonagrarian jobs, household spending in the urban states is impervious to the changes in rainfall. The divergence among the rural and urban states has thus cleaved the country afresh. It’s no longer just a wealthier urban India and a poorer rural India. Grafted on to this old divide now is a rainproof India where economies and lives are robust to idiosyncratic rainfall patterns, and a rain-dependent India where vulnerable economies and insecure lives hang on the intractable monsoon. This yawning faultline should be the country’s pressing concern during the monsoon season rather than the distracting preoccupation with the rain’s impact on he overall economy. Political economist at Syracuse University's Maxwell School of Public Affairs in New York.